The Philippine Constabulary Band was a symphonic band formed in 1901 by Lt. Walter Loving of the US Army’s 48th Volunteer Infantry. On October 15, 1902, US Civil Governor General William Taft formally approved the band, originally composed of 400 volunteer male vocalists. Since its first public performance on May 20, 1903, the band has brought the country international fame through its participation in international competitions, including the 1904 St. Louis Exposition in the USA, where the band placed second, despite the power blackout that occurred during one of its performances. The band also represented the country in the 1915 Panama Canal Exposition in the USA. There, John Philip Sousa, known as the “king of marches,” cited the band as among the world’s greatest. The band also participated at the 1937 Golden Gate International Exposition, and played during the 1909 inauguration of US President William Howard Taft. Unfortunately, the band was disbanded during World War II, where most of its members were killed and instruments were lost. Lt. Loving was also killed during the 1945 Battle of Manila. 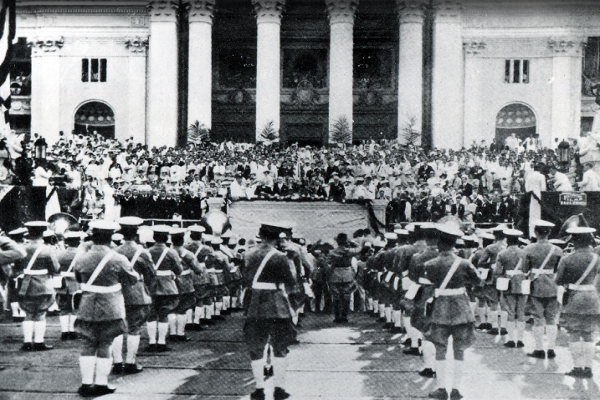 The band was reorganized in 1946, and placed under the service of the Philippine Army. It was led by Col. Antonino Buenaventura. Buenaventura, who was the leader of the band for 16 years, was named a National Artist for Music in 1988. The band, later renamed the Philippine Army Band, became the country’s leading military band. Tiongson, N. (Ed.) (1994). CCP Encyclopedia of Philippine Art, vol. 6: Philippine Music. Manila: Cultural Center of the Philippines.